You are stranded on a spaceship with only a grappling hook to defend yourself with. Survive for as long as possible by protecting the spaceship's powercore from the enemies that are attacking your spaceship. Your spaceship will loose health when an enemy is on your ship, and when an enemy attacks your spaceship's core. If you stand in front of an enemy for too long it will attack you. As you can't move in space using WASD you might become stranded if there aren't any objects in reach to hook on to with your grappling hook. You can either play the game in your browser or download it. I actually really love the idea of this game. It reminds me of space movies when people float out of the ship. As far as the execution, it isn't clear to me how the game ends. I can't tell if I let too many enemies by or if time ran out. I think it would be more fun if the game was longer and had more enemy types. But the core concept and gameplay is incredibly awesome. Thank you! The game was heavily inspired by those scenes when people were floating outside the spaceship in space, so I'm glad I got that across in the game! The current build of the game doesn't really have an ending, you're just supposed to survive and gather points. If I continue working on this game I will make sure to add a proper ending or goal and make it clear to the player. The game ends when your ship is out of health, the health bar can be seen at the top of your screen. 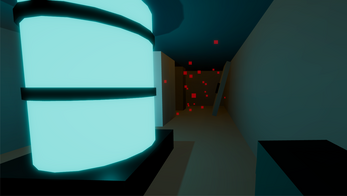 When an enemy attacks the spaceship's "core"(blue cylinder to the left from where you spawn) the ship will take damage. I will look in to a way of making this clear when playing as I realize that this is not obvious to the player. I definitely agree that the game needs more enemies and varied gameplay, so that it doesn't get boring so quickly.